Winner: first place in the 2016 CIPA EVVY Book Awards! Dog Writers of America Association's Certificate of Excellence in New York City! Is your dog afraid of noises, objects, or you? See through fearful dog's eyes in anecdotal stories about real saved dogs. Discover how to help dogs that have been neglected, abused, or are genetically timid. Learn unique approaches and how to help your shy companion face life in a human world. Develop the close bond that only trust can bring. Fearful dogs can be saved and have quality lives, free of anxiety. Beyond Flight or Fight will give you practical, easy-to-understand tips that will ease your frustration, guilt, or confusion. This book will help (1) you grow in compassion, (2) your pup find peace, and (3) bring both of you to a warm appreciation for each other. Would you consider the audio edition of Beyond Flight or Fight to be better than the print version? I think that hearing the book, you can pick up the emphasis points of training much easier. You hear how to praise a dog with high inflections in your tone and understand how it affects the dog. What was one of the most memorable moments of Beyond Flight or Fight? I was very interested to learn many tips, to see how a dog could easily be misunderstood and once placed with an understanding trainer/owner that fearful traits can be managed. I was also surprised to learn that noises from a TV could upset a rescue, obvious now, but before this book, I had not taken any notice of what family members were watching. Great book, I do not 100% agree with everything, but we all have our own views, but I have learnt a lot too. Highly recommend this title. Have you listened to any of Richard Rieman’s other performances? How does this one compare? This was my 1st and I intend to listen to it a few times over. This book was a huge eye opener. I work with dogs most days and have rescued lots over the years and this book helped me see where I had naturally made the correct choice in my training methods and where I could have got a quicker response had I tried another. This book is great for anyone who rescues dogs. As an avid animal lover, I'm always trying to find homes for the unwanted stray dogs and cats. Behavior problems always make it difficult to find the right family to care for them. As a result, I've ended up keeping the most challenging animals. I have a very timid Chihuahua that's a constant work in progress. I've tried to follow some the techniques a very popular pet whisper employs but some of his methods are just to abrasive for me. By building trust like Sunny says, I've been able to make progress with him. I much prefer this method to flooding. This book offers many tips on how to handle behavioral problems in a non cruel way. If you've ever wanted insight from your furry friends POV you'll want to listen to this. I was lucky enough to be given this book for free that I highly recommend. Frist a shout out to Sunny for all the work she has done with dogs! I wish there was more people out there like her. She has some great tips, and stories in here. I hope everyone who owns a dog reads this. Even if its just to understand how dogs think if nothing else. 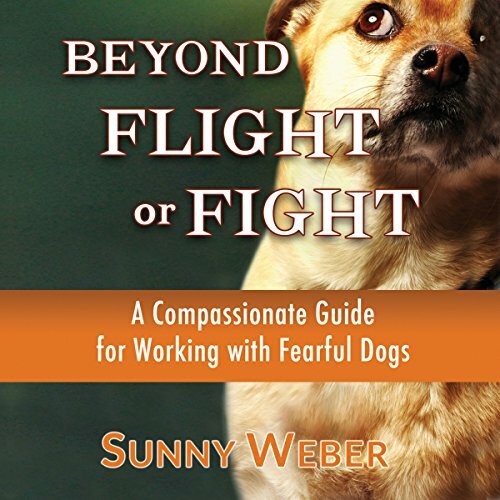 Beyond Flight or Fight: A Compassionate Guide for Working with Fearful Dogs by Sunny Weber was a great read by the author. I loved reading this great book with tips and tricks to working with a dog who is fearful. This is a must read for any dog owner especially if they have anxieties. If you could sum up Beyond Flight or Fight in three words, what would they be? What other book might you compare Beyond Flight or Fight to and why? I have never read a book like this before. Wonderful guide. I enjoyed all of this book, it was a very interesting learning more about how our dog think. It was a very good guide. I love how the author give us information on how to help our fearful dog. I learned so much more about how and why my dog behave the way he does. So much good information packed in this book. A must read for anyone who love dog, good for anyone who have a fearful dog. Learn how your fearful dog think. I was given this free copy audio book at my request and have voluntarily left this review. As a proud mamma of 8 rescue dogs I definitely recommend this book. I always seem to end up with the "problem" dogs. From aggression to the severely timid ones it can be very frustrating dealing with them at times. This helps give you the tools needed to help rehabilitate troubled dogs. I fell in love with this book from the title alone, and the content didn't disappoint. The author, Sunny Weber is clearly an expert in helping us humans to understand what's going on in the minds of our furry friends when they act &quot;badly&quot; in our eyes. It's their instincts kicking in, and it's not their fault. Narrator Richard Rieman reads boldly, clearly and kindly to explain the topics in a way that are easy to digest. I'm already a fan of Richard's narration, and this just adds one more to my growing list of works that I've enjoyed by him. Overall, this book is a great guide to help people first to understand, and then to deal with the issue of unsocialized, abused or abandoned dogs who have trust issues. There's way too much to summarized and I wouldn't do it justice, so if this topic interests you, spend a credit or a few dollars and do yourself a favor and learn about what you can do to help your four legged friends be better behaved and have a better life. I was given a copy of this book for this review.